Twin-Control is a European project aimed to develop a new concept for machine tool and machining process performance simulation. 11 European partners including research centres, industrial and technological companies, and universities are uniting their efforts. They are located in Spain, Germany, Belgium, France, and the United Kingdom. The project coordinator is Spain-based research alliance IK4-TEKNIKER. The project started on October 1st, 2015, and will last 36 months. It has a total budget of 5.6 million euros and it is funded by the Public Private Partnership (PPP) for Factories Of the Future (FOF) within the European Framework Programme for Research and Innovation, Horizon 2020 (grant agreement nº 680725). Simulation capability is currently a key complement to European machine tool industry expertise in order to increase competitiveness. entire value chain. However, the different software packages are focused in a single feature related to machine tool or machining process. Due to the fact that machining process performance is related to the combination of the different phenomena (machine tool kinematic and dynamic behaviour, machining process, tool path, workpiece dynamics, etc. 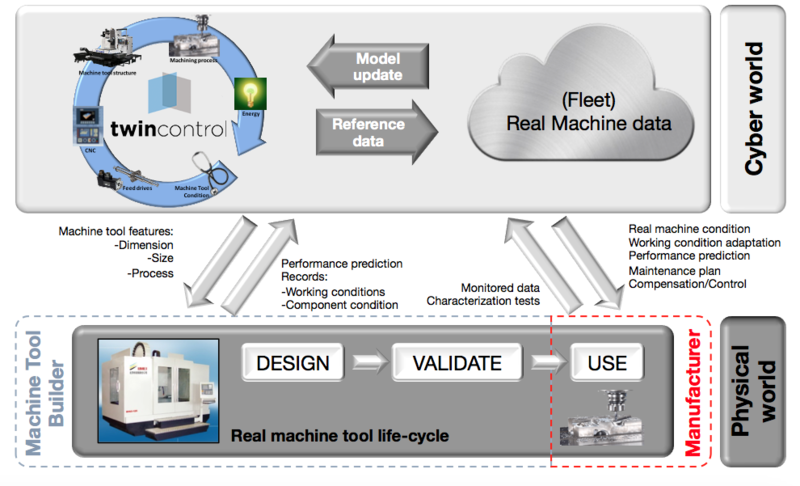 ), it can be concluded that there is a need to integrate the most important effects in a common simulation environment in which the machine tool, the process and other aspects are simultaneously analysed. Furthermore, the existing simulation packages ignore the real condition/state of the machines and do not directly act to the machining process. Twin-Control is a machine tool and machining process simulation project that unifies the different features that affect the machining process by integrating improved simulation models, including increasingly important lifecycle features like energy efficiency or maintenance optimization. The applied holistic approach provides a more realistic performance of the models and, hence, more accurate estimations. Apart from estimation purposes, the developed tool will be installed within machine tool CNCs and will allow a direct control of the process through monitoring. The monitored data combined by the model-based estimations will allow an improved performance of the manufacturing process by controlling component degradation and optimize maintenance actions, increase energy efficiency, modify process parameters to increase efficiency or even smoothen it to protect a degraded component until the next planned maintenance stop, etc. The integrated concept adopted by Twin-Control will enhance the necessary collaboration between machine tool builders and part manufacturers in order to improve the productivity of the manufacturing processes. The Twin-Control project has a duration of 36 months and is divided into 9 work packages. The project will start with the definition of the twin reference model concept, its architecture and the different experimental characterization and validation tests to be performed (WP2). The independent modules that will integrate the Virtual Manufacturing System will be developed under two work packages that will be executed synchronously. WP3 will include the development of the Virtual Machine Tool and WP4 will lead with the Virtual Machining and Virtual Lifecycle modules. Developments performed on both WP3 and WP4 will be validated and improved according to validation results. In parallel, all the activities involved in the characterisation and monitoring of the real machines (Physical world) will be performed within WP5, including fleet-based data management and the determination of the model-based control actions. In WP6, the developments made through WP3 to WP5 will be integrated properly in a common environment and then implementation in the most used commercial CNCs. Finally, Twin-Control will be validated and its reliability demonstrated in WP7. Two different industries will be faced, aerospace and automotive, each of one providing a different validation and demonstration scenario. Additional demonstrators will be performed by implementing Twin-Control in three reference pilot lines in order to enhance industrial dissemination. Core WPs dealing with project management (WP1), exploitation plan development (WP8) and dissemination and communication (WP9) have been also put in place. A reduction of time to get machine working as designed (10% time & cost reduction). A reduction of time to get process working as designed (20% time & cost reduction). Getting a first-time-right part manufacturing (75%) of all new processes. An improvement of process performance trough model-based control (increase of 1-2% in machine up-time). The reduction of energy consumption (25-50%). An improvement of machine reliability and increase machine up-time due to a proactive maintenance (2-4.5%). Reduction of machine tool life cycle costs (15%) with a reduction of O&M costs in the range of 25% for manufacturing system and process.